Little, Brown and Company, November 2008. Malcolm Gladwell is the bestselling author of The Tipping Point and Blink. His latest book, Outliers, has been on the best seller list of The New York Times for eight straight months, since it was published in November 2008. Gladwell’s engaging and journalistic writing style and his talent for simplifying complex issues, I believe, are his secrets of success. And these are the reasons why his books are both controversial and popular. His latest book is no exception. Outliers attempts to explain the secrets of successful people; it proposes that intelligence (IQ) alone is not a guarantee of success in life. However, this view is an already well-known fact that has been established during the early 1990s by a host of academic studies which discovered that success indeed requires additional competencies, known as emotional intelligence (EI). Unfortunately, Gladwell does not expound on, or even refer to, the growing body of literature on EI. Instead, Gladwell focuses on several other significant and equally important ingredients of success. In fact, his book naturally complements the EI studies and explains the “secrets” of success from a different perspective: by taking into account the personal, environmental, and cultural contexts of success. In this book review, I will highlight the main secrets of success covered by Outliers starting with the advantage (or luck) of being born at the right time of the year. One example Gladwell highlights is that of Canadian hockey players and Czech soccer and hockey players who are born during the first six months of a year and have a distinct advantage of age and maturity over their teammates. This is due to the eligibility cutoff age of January 1 in those countries. As Gladwell explains, “A boy who turns ten on January 2, then, could be playing alongside someone who doesn’t turn ten until the end of the year – and at that age, in preadolescence, a twelve-month gap in age represents an enormous difference in physical maturity”. What about the year of birth? That, too, explains the implications of being there at the right time, at the right age. Gladwell cites the Silicon Valley tycoons who were born between 1953 and 1956 and were thus at the perfect age in 1975 to take advantage of the personal computer revolution. Here are the names and years of birth of some of these successful men: Paul Allen (1953), Bill Joy (1954), Scott McNealy (1954), Steve Jobs (1955), Eric Schmidt (1955), Bill Gates (1955), and Steve Ballmer (1956). Gladwell later argues that New York lawyers born in the early 1930s also had a tremendous advantage when the boom in the number and size of corporate mergers, hostile takeovers, and litigation took place during the 1970s, mainly due to the relaxation of Federal regulations. Gladwell proposes that it is the “10,000-hour rule” of hard work and practice which explains why many people achieved success. He provides examples of Bill Joy’s contributions to UNIX, Java, and the Internet; Mozart’s masterwork was composed when he was twenty-one, although he started writing music at the age of six; the Beatles and their Hamburg experience of playing music eight hours a day, seven days a week between 1960 and 1962; and Bill Gates who put in thousands of hours of computer programming starting at the age of thirteen. In addition to being smart, these people achieved success by putting in 10,000 hours of practice before becoming outstanding at what they did. Two other “secrets” are discussed at length in Outliers: culture and education. Gladwell compares the safety record of airliners in the 1990s, and notes that the Colombian captains (Avianca) and Korean captains (Korean Air) in certain cases could have averted plane crashes if their cultures permitted subordinates (copilots and flight engineers) to speak out and warn the captains of impending disasters. These two cultures place a high value on power distance, meaning that subordinates defer to their superiors even when these superiors may in fact be in the wrong. In brief, subordinates were reluctant to speak out because of fear and/or respect; a very dangerous cultural “dimension” when one is flying a passenger plane! In effect, Gladwell argues that it does matter where you were born and what culture you were raised in. Citing culture again, Gladwell attributes the high scores on mathematics tests in countries such as China, Singapore, South Korea, and Japan to the strong work ethics and the demanding nature in those countries of the all important wet-rice agriculture. Here again, Gladwell fails to mention that rice is also grown in other countries, such as Philippines and Indonesia, whose populations are not necessarily known for high scores on math tests. Gladwell also does not mention the Protestant ethics of hard work which may have contributed to the rise of capitalism and the industrial revolution, or the fact that growing tobacco used to be as demanding as working in the rice paddies. 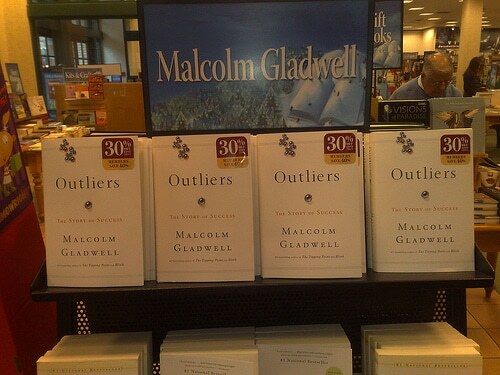 Finally, Gladwell links the quality of education to success. He cites the longer days and hours of high schools in Japan and South Korea, “the school year in the United States is, on average, 180 days long. The South Korean school year is 220 days long. The Japanese school year is 243 days long”. Finally, Gladwell mentions the vast advantages and opportunities provided by KIPP Academy middle schools which were started in the South Bronx, one of the poorest neighborhoods in New York City. Students at KIPP excel at mathematics and reading, and a large percentage of them go on to university and “in many cases being the first in their family to do so”. KIPP school days start at seven twenty-five and goes on until five p.m. All students take classes in thinking skills, English, science, mathematics, social science, music and orchestra. KIPP gives its students a chance to work very hard and to excel. Although it is written with a journalistic, rather than academic approach, Outliers has undoubtedly contributed to the ongoing thinking about success in the corporate world. It highlights the importance of hard work, determination, opportunity and luck, family upbringing, personal circumstances, and culture. Despite its shortcomings, mainly its lack of academic rigor, Outliers is a highly recommended book for those who want to explore the “secrets” of success, beyond IQ and EI. How Can Competent Traders Become Expert Traders? The Beatles – Why they were Fab – Songwriting Tips and Secrets for writing #1 Hits.